Snuffers were used to shorten the wicks of burning candles and prevent them from burning too fast. Snuffing was an essential task until 1820, when the smokeless wick was invented. The blades on these snuffers trimmed the wick while the heart-shaped box held the cut-off ends. The snuffers bear the arms of Edward VI along with the inscriptions 'GOD SAVE THE KYNGE' and 'EDWARDE WYTHE ALL HIS NOBLE COUNCEL'. Edward, the only surviving son of Henry VIII was king from 1547 to 1553 and was succeeded by his half-sisters Mary and Elizabeth. 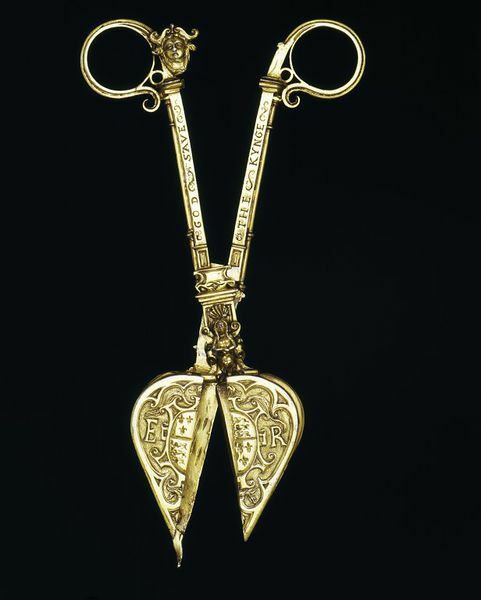 The snuffers were passed down through the family of his uncle, Edward Seymour, Duke of Somerset and Lord Protector, who was the brother of Jane Seymour, the King's mother. These snuffers are an extremely rare survival from the Tudor court and show the care lavished by the court goldsmiths on small domestic items.The heart-shape of the wick box and the chased central panel were standard decorative forms in northern Europe. The lack of a hallmark may suggest that this was a special order for the court and not sold in a shop. 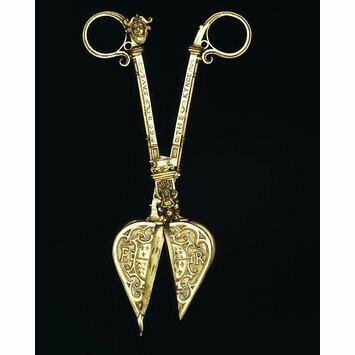 Before candles burnt cleanly, snuffers (a type of scissors) were used to ensure candles did not produce too much smoke. The blades of the snuffers trimmed the candle-wick, and the heart-shaped box held the trimmings. Made in England, between 1545 and 1547, during the reign of the child king Edward VI, these snuffers were cast in silver and gilded (covered in a thin layer of gold leaf). Very rare, they are probably the earliest surviving examples made in England. They were made for the Tudor court, as they are engraved with Edward VI’s coat of arms and the words ‘GOD SAVE THE KYNGE’ and ‘EDWARDE WYTHE ALL HIS NOBLE COUNCEL’. The snuffers were used in the Privy Chamber at Whitehall Palace, where the young king met in council with his advisors. A later woodcut of 1563, from the reign of Elizabeth I, shows Edward VI with his advisers at the window of the Privy Chamber, listening to Bishop Latimer preaching in the Privy Garden below. We know that Edward used the ‘chamber agenst the pulpet in the prevey garden’ for council meetings, because surviving records show that the windows were reglazed in 1549. The form and decoration of the snuffers are characteristic of Northern European metalwork. The earliest surviving pair, thought to be European, and dating from 1511-14, are in the British Museum. They bear the coat-of -arms of both Henry VIII and the Archbishop of York, Cardinal Bainbridge. They are similar to some copper snuffers, excavated from a late 16th century Venetian shipwreck at Knalic, Croatia, which may be of Italian manufacture. ‘Snoffeffers’ were used a hundred years earlier, as they are mentioned in records of the silver belonging to All Souls’ College, Oxford. The earliest recorded use of the accepted modern word, snuffers, is 1517-18, when the City of London church, St Mary at Hill, ‘paid for Snuffers of Plate [silver] to put owte the tapurs’ (a slender form of candle). made for use at the Tudor court and are engraved with the coat of arms of the young Edward VI. Their form and decoration are characteristic of Northern European metalwork.